Dining at Nobu, the Melbourne sensation of International chef, Nobuyuki Matsuhisa's, chain of highly-acclaimed Japanese restaurants, conjures up a mixture of emotions. The food never fails to please the eye and tastes superb, but will leave you with a hefty bill if not carefully monitored. It also would not satisfy those seeking to enjoy a meal in serene atmosphere - I am speaking from experience, with all hope of a quiet dinner on a relaxing night out diminishing as soon as we were escorted by the hostess from the bar, down the stairs into the bustling dining area - with all the wait staff yelling out 'Irasshaimase' (Welcome!). However, despite your mood, it is so easy to be absorbed into the buzzing vibes created by the upbeat music, scurrying waiters, frequent turnover of diners and lavish surroundings of timber furnishings and amber lighting. 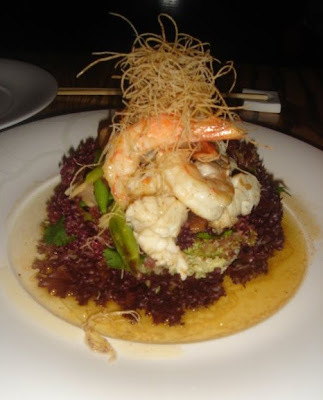 One must also be forgiven for ordering another string of dishes while the first lot is yet to arrive at the table - it is hard not to be captivated by the appetizing dishes flying out from the kitchen. A disappointment for me is the lack of variety in the menu - there has been little change over the past couple of years, with the escalating price of each dish the main alteration. 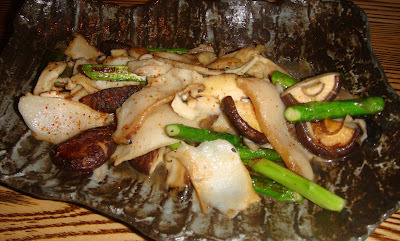 This particular visit to Nobu was on new year's eve of 2008 and the night sure was made to be an extravaganza of novelty and masquerades. The whole restaurant was buzzing with chatter, laughter and great vibes. We needed to book our seats beforehand and pay a $150 non-refundable deposit (per couple) that would be subtracted from our total food and beverage bill at the end of the evening. The waitresses were dressed up in crazy outfits and masks, and each diner had a colourful feathered mask and capes at their table to join in the fun and masquerade theme. 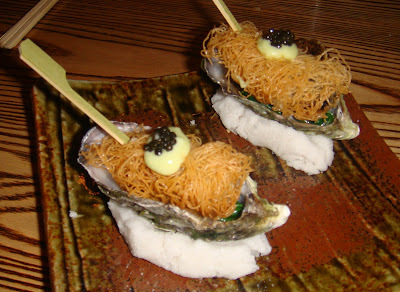 Crispy Oysters with Creamy Wasabi and Caviar - It is such a playful, yet attractive way to serve oysters on fancy bamboo skewers. As you bite through the crisp threads of kataifi pastry, salty juices from the oysters seep out and taste brilliant with the spicy mayo and bursts of caviar. 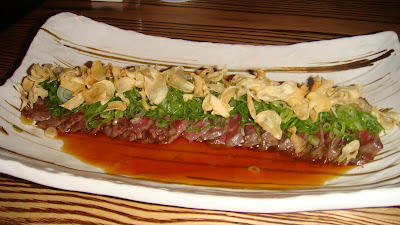 Wagyu Tataki 9+, Onion Ponzu and Garlic Chips - For me, the spring onion and garlic overpowered the delicacy of the thinly sliced beef. 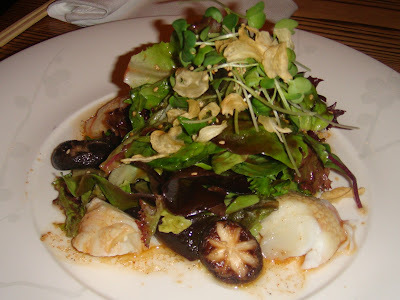 Southern Rock Lobster Salad with Spicy Lemon Dressing - This dish was so finger-licking good, it was such a shame to find only four small pieces of lobster in it! 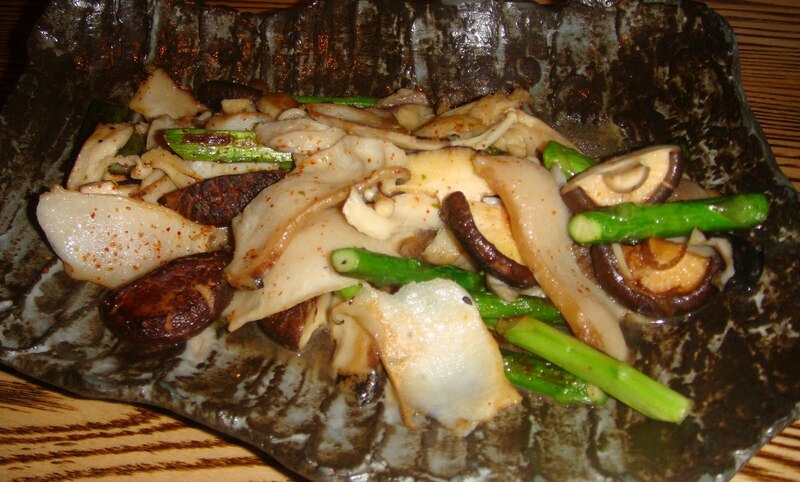 Abalone with Shiitake, Enoki and Abalone Mushrooms in Light Garlic Sauce - Can't go wrong with a dish full of earthy mushrooms and sweet abalone. 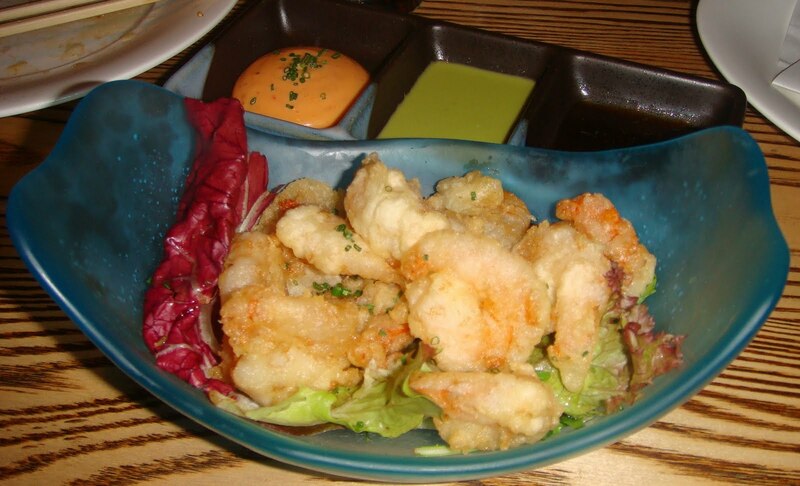 Baby Tiger Prawn Tempura with Creamy Spicy Mayonnaise, Jalapeno Sauce and Ponzu Dressing - Quite an ordinary dish, but nonethless fried to perfection. 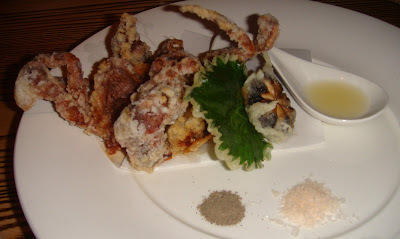 Soft Shell Crab Kara Age - I love the element of creating your own seasoning with the lemon juice, salt and pepper; although the crab is so juicy and full of flavour already that just a little is needed. Prawn and Lobster with Spicy Lemon Sauce - I order this dish everytime we visit Nobu. The tangy dressing is my favourite - It is so refreshing and tastes beautiful, combined with the crisp lettuce leaves and sweet morsels of prawn and lobster (which I always use to try and mop up all the juices on the plate). 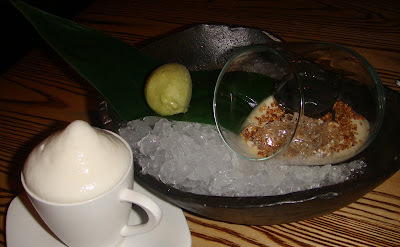 Suntory Whisky Cappucino layered with Crunchy Coffee Cacao, Coffee Milk Ice Cream and Yamazaki Whisky Foam - I am not a fan of desserts that are strongly infused with alcohol, so this was not palatable at all for me. All I could taste was the whisky! Goma Trio of White Sesame Panacotta, Black Sesame Sauce and Toasted Sesame Sugar with Sake Jelly and Green Tea Ice Cream - Lovely presentation, but somewhat lacking the wow factor in taste. Perhaps I was too full to properly enjoy the sweets!